Is the Peloton bike worth the money? The answer is yes x 293840281. This is by far the best purchase I’ve made… in a very, very long time. I feel like I’ve told this story a lot already, but some may have missed it: they packed up my spin bike in Valdosta to put into storage for a while. (Aka the stuff in storage… well, I have no clue when/if I’m going to see it again.) 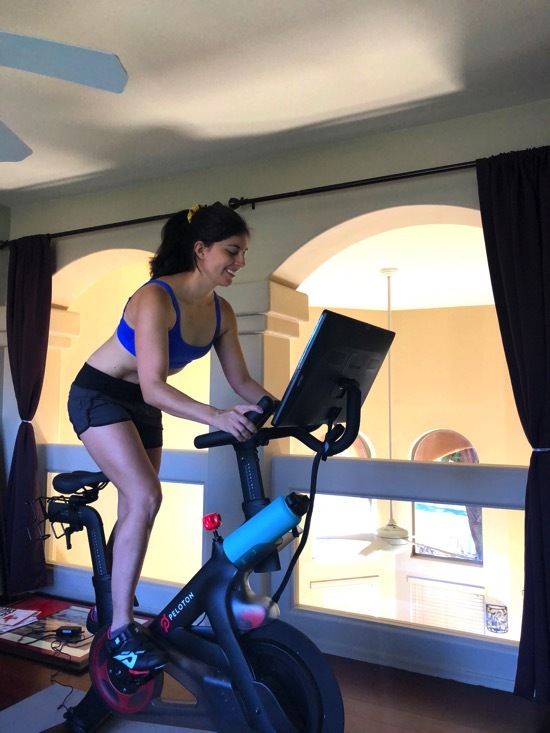 At the time, I was like, “Maybe it won’t be a big deal” but after being here for a few weeks, especially with the girls home from school for the summer, I realized how much I depended on using my spin bike for at-home cardio. It’s been way too hot to run outside, and sometimes making it to the gym isn’t going to happen since it doesn’t offer childcare. 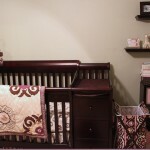 – The set-up and installation were a breeze because I didn’t have to do any of it! When you purchase the bike, it includes set-up and installation. The guys were insanely fast; you can tell they’ve had experience putting these bikes together. I decided to put a mat under the bike so it doesn’t damage the floor. For the spin shoes, I took them to a local cycling shop and they installed the clips for me. – You turn the bike on, log into internet, and boom. You’re ready to ride! They also have helpful videos online for how to set-up the bike for your preferences and height. 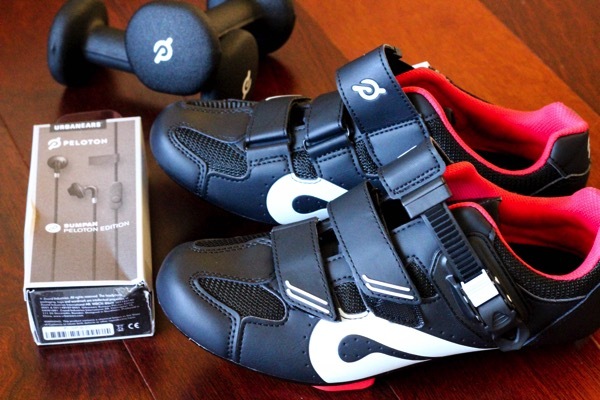 – I ended up getting the bundle package for free (military), so it came with shoes, headphones, and weights. (I rolled with the 2lb. since I have a 3-lb. pair already.) You absolutely need the shoes for the bike, so I think it’s worth getting the bundle package. – This is something I obsessed over for the first day – I wanted to take good care of it! – and after tons of research, I bought these natural gym equipment wipes and these touch screen wipes. They’re both amazing and I highly recommend them. 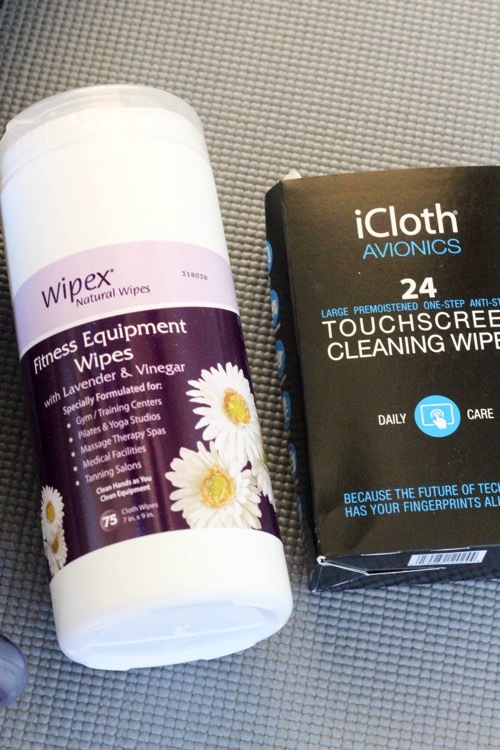 I use the lavender wipes after every ride and clean the touch screen every 2-3 classes. When I had the app on my phone, it was $12 a month. When you purchase a bike, the price jumps ($39/month) but you can still use the app on your phone for the extra treadmill, bootcamp, yoga, and stretch classes. I feel like it’s a little bit of a bummer that the subscription is more expensive if you own a bike (like hey buddy, I already gave you a decent amount of money) but after taking live classes, I feel like it’s worth it. They add so many new classes each day that the variety is unlike anything I’d be able to get at a local studio, especially for $39/month. The huge question here is whether I think it’s worth getting a less expensive spin bike and using the app (on your phone or tablet), or if I think it’s worth biting the bullet to buy the actual Peloton bike. Before I owned one, I thought it would be a tough call, but after using the bike for the past couple of weeks, the Peloton wins by a landslide. That’s largely attributed to 3 features: the live classes, instant feedback, and the leaderboard. – You can jump into live classes, which really gives you the feel of being in the studio. It’s pretty incredible to ride with a powerhouse instructor and Peloton fans in the NYC studio and all over the world. – Instant feedback and stats. This is what really takes the bike to the next level. 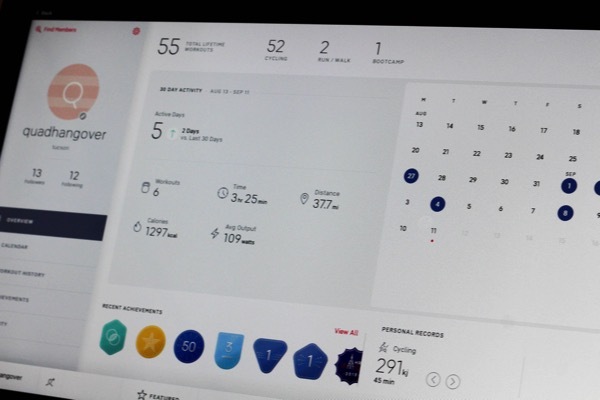 On the screen, you can see your cadence, resistance, and output. The screen was broken off my last spin bike during the move. I was going by RPE, and found out that I wasn’t working nearly as hard as I thought I was. The real-time stats were an interesting reality check for me, and also encouraged me to really push myself on speed and resistance. Your position on the leaderboard is determined by output (in kilojoules and is a combination of resistance and speed). – The only con I can think of is the fact that the bike takes up a decent amount of space. You definitely need to have room in a guest room or office. It does roll, so you could also hide it in a larger closest if you ever had guests or needed to move it. So I think that covers everything! Please let me know if you have any questions about it! Do you have a home gym? What do you think has been your most important investment for your health? 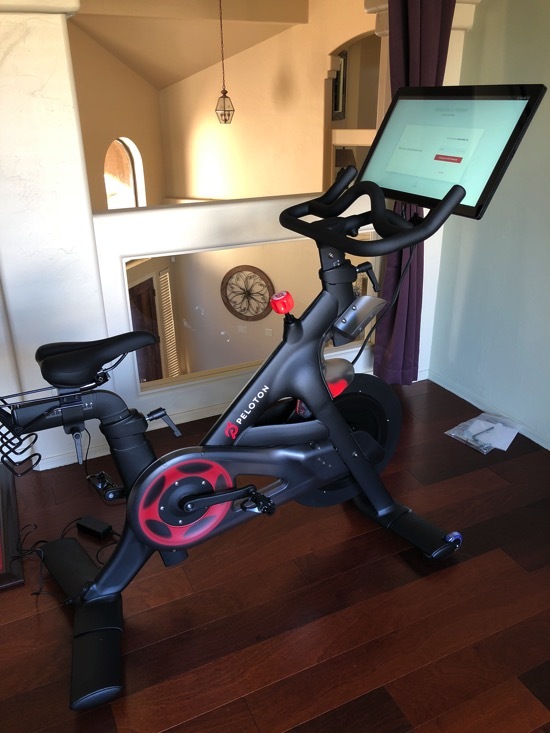 I have a bike (a cascade from a local gym equipment store) with a computer on it so i can see my resistance and rpm and use the peloton app. My original spin bike didn’t have a computer and i agree It’s a MUCH better workout with the metrics. I love The other classes on the app too! As a mom of 2 little ones working full time I’m team home gym all the way!! Can I stream other apps on the Pelaton tablet? lol!! I’ve got to insert my LOVE for my Peloton!! I’ve had it since May. I lift weighs 5x a week and this has been amazing for my cardio. I take every 80’s ride I can and sing along.. even for my 4 am classes. Hands down the best fitness purchase I have ever made. This took the place of my Orange Theory classes and honestly I think I may like it more. Any other cardio equipment would feel like a chore to use… like I “have to” go run or ride, but this feels like a party. Every. Single. Time!!!! PS… can we get your screen name to follow you? haha i totally sing along to the 80s rides, too! i need to do them more often. I’ve been curious about the peloton bike. Thanks for reviewing it! and yes, having a home gym with a kiddo makes a huge difference, unless you can find a gym or studio with amazing childcare. Omg I’m military and I paid full price for the bundle when I bought my bike. Howwwwwwwww annoying!!!! But it is amazinggggggg!! I have one con-the shoes only come in whole sizes. So if your a half size-either too big or at times snug. Other than that I HEART everything to do with the bike!!!! I paid in full too 🙂 I bought online not by phone but I did email and they did credit me back the money-months later. So thanks for your post so I got a little back! As a spin instructor, all I can say is I need this bike in my life! Do you have a recommendation for cycling shoes, not don’t have clips? Or do you think clips are a must have for spin class? Why would there be a possibility you wouldn’t see your stuff in storage again? Did something happen to it? We finally are getting our stuff out of storage after over a year! I’ve had my Peloton Bike for nearly 3 years and I love it just as much now as the day I got it. I did my 500th ride live a couple weeks ago with Matt. It was so fun going to the live studio! Matt and Robin are my favorite instructors-but I enjoy all of them. I’ve started doing their other classes on the app–the outdoor runs with Robin are the best–she is so motivating! I get so excited when I meet someone else that has the bike-I could talk about it forever. that is SO INCREDIBLE you got to hit that milestone live in the studio! the next time i go to nyc, i can’t wait to take a class! question…does this also work like a tv if i wanna just spin and watch a show? or is the screen strictly class apps only? thx and awesome review! ahhh no it doesn’t. that would be amazing, though! Can you use other clip in shoes? Or, are the specialized for the Peleton bike? Ok. I’m getting married May 2019 and me and my fiancée cannot think of ANYTHING to put on our wedding registry and a few weeks ago I thought….LOL maybe I’ll just put a Peloton on there and ask for donations?!! My fiancée was not psyched I shrieked when I saw this post and read the first couple lines to him, out loud. I think it will somehow sneak it’s way onto the registry after all. I don’t need anymore plates!! Isn’t it amazing? I know people use their own bikes and the app but I feel like the bike takes it to another level just like you said. Live classes are my favorite and I usually hop on to the live DJ class on Sundays with Cody and DJ John Michael. I plan on riding my 150th in the studio next month! Ahh, thank you for this!! I’ve been hearing about these bikes and wondering if I should look more into it. Your review was very thorough–Thank you! Question–how much are they? Do they offer finance plans? Did you cancel your gym membership when you bought it? I only do spin classes at the Y and can’t afford boutique classes like flywheel or soul cycle, but am obsessed with spin. Thoughts? Can I afford this? i get free gym memberships at the studios where i teach in town, and pay for my orangetheory. for barre3, i do 10-class packs and just use them whenever. Thanks so much for the review! I have been eyeing the Peloton for a while but the $40 a month cost is my hang up. What if You don’t want to do the $40/month – does the screen just not work then? Can you buy a bike without a screen? Are you locked into the $39/mo forever? If you wanted to disengage from the Peleton classes altogether for awhile, could you do that? what an awesome review! although i totally expected it. this is exactly what i would buy if i could get one piece of equipment. i love spinning and the vibe of a studio, but monthly memberships…yikes! i’ll stick with the classes in my gym, thanks. oh but to do this awesomeness in the comfort of my own home/apt? hells yeah. good post, Gina!! Um yes yes and YES!! Love this bike and your review is right on!! I wasn’t sure about it and whether I would use it over time and it’s expensive ($2500 + $39/month). Before I bought it I had walked by the 23rd st. studio numerous times and I never knew what it was or had much interest in finding out. It was actually a friend who had one — and she was so into it — that got me curious so I went into the store one day and got the “pitch” but I still wasn’t sure. The studio incidentally is relatively small (they are moving next year I think to a massive space over by the new Hudson Yards but the live classes have zero interest for me anyway even when they are free. They have some free classes every day which I guess is nice if you live nearby and can get over during the hours they are offered). Anyway, bottom line is I love it. I don’t use the leaderboard but having the package (bike/screen/metrics) makes all the difference in getting me through a good workout of what otherwise is a fairly dull activity: peddling a stationary bike. I really like the metric oriented classs (HR zone and PWR zones) and the bike itself I think looks good for an excerics bike and takes up very little space, which is a big issue for us apartment dwellers. I can’t stand when Jess King sings by the way. I had to mention that. 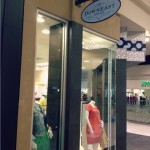 But they do have a wide variety of classs so you can find what works for you. If you ar on the fence and it is within your budget I highly recommend it and if it doesn’t workout I think the resale value is good. Wanted to let you know I bought one of these today thanks to your review and some other research! I’ve been a long time follower of your blog and appreciate you taking the time to review it for your readers! When I bought it, they asked if I knew anyone who owned one, so I gave them your name (hope that’s not creepy haha!) and I think we both got some kind of credit for it! Thanks again! Great review! Makes me want to go out and buy one! 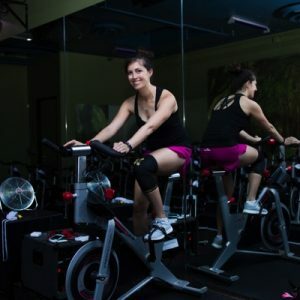 I understand that access to the Peloton classes and instructors is a great advantage of the Peloton bike, this review (and all other Peloton reviews that I have read) focus on the classes and instructors but I don’t see a lot of review of the bike itself. How does the physical bike compare to other exercise bikes on the market? Will it last forever? (if I am paying 2 grand for an exercise bike it better be well built and built to last) what kind of maintenance is required? any known issues or parts that typically wear out? Who do I contact if a repair is required? If multiple people use the bike, is it easy to adjust the bike for a specific rider? this is a great point- i’m sorry i didn’t address it in the post!